Home » Linux Gaming News » Steam, why is it down so much lately? Steam, why is it down so much lately? If you are a user of the gaming platform Steam on PC, Mac or Linux, you may have noticed that the service tends to go down #frequently in recent time. Going down means that you will lose the connection to Steam, see your friends and contacts listed as 0, and cannot use any of the #services that require an online connection. You can still enable offline mode and start to play single-player games, but every activity that requires you to be online, chatting with friends, trading, buying games, joining multi-player games, won’t work when Steam is down. Since this is happening more frequently than in the past, it is time that we take a look at why this is happening. The first problem that you run into when you try to analyze why Steam is down that much is that Valve has not made any announcement in this regard yet. We do have access to a couple of statistics though that we can use to find out about it. While those may help us find a plausible cause for the downtime, it is not confirmed by Valve and until that happens, much of this article is guesswork. Down times are not anything new on Steam. If you ever participated in a sale you know that the site tends to go down once a new batch of games on sale are pushed to the store. This is caused by too many users trying to access Steam or the store at the same time. 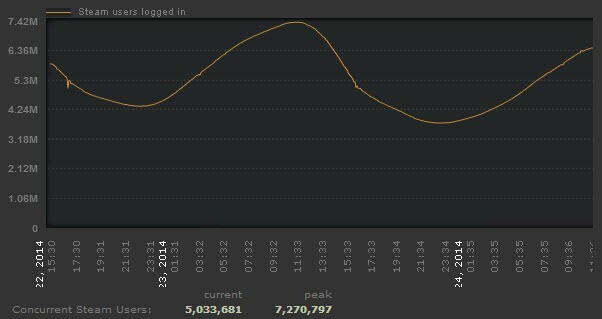 If we look at Steam’s growth in recent time, we notice that it made quite a jump in concurrent users and popularity. 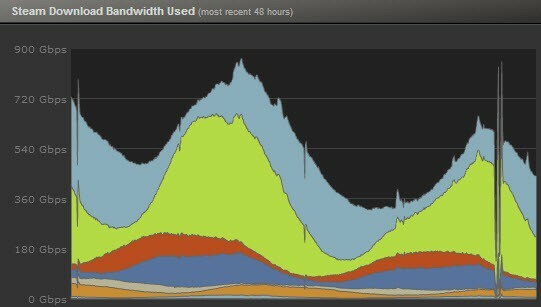 At peak times, more than 7.4 million users are logged in on Steam at the same time which is an increase of roughly one million users compared to the year before, and about 10% of Steam’s overall active user base. Not all of those logged in users are playing games though. The download bandwidth used page shows those peak times as well. 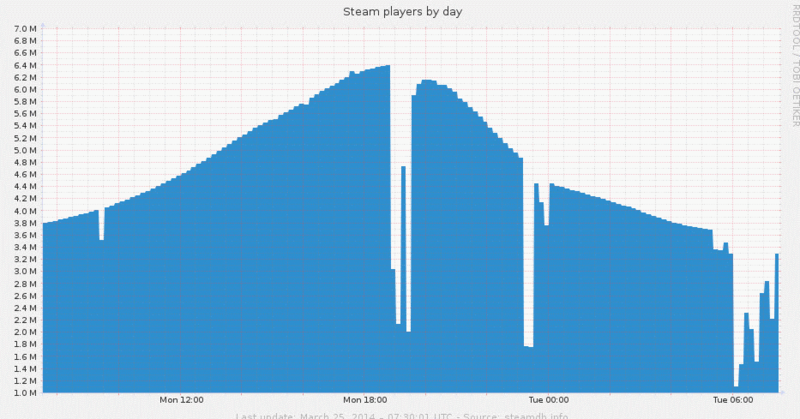 The first explanation for Steam’s downtime therefor suggests that the increase in users is causing Steam to go down more frequently during peak hours. If you check Alexa, a company that measures the popularity of websites, you will notice that the Steampowered website made quite the jump in the last two years jumping to position 465 from 1600 of all websites. It is interesting to note though that the down times do not always correlate with the peak times as you can see on the graphs that Valve makes available on its website. Yesterday however they coincided well with the peak playing time on Steam according to Steamdb. Downtime happened where player count dropped significantly. If you check Steamcharts, a third-party site tracking Steam player numbers, you notice that Steam has been going down nearly every day in the past seven day period. There are other possible explanations for Steam going down frequently in recent time. It could be a DDOS attack on the network that is causing Steam to become unavailable for a short period of time before it becomes available again.